Why Creative Tension Trumps Problem Solving is a guest post from Gary Ryan, founding Director of Organisations That Matter. Gary's post is a great way to conclude the series of guest posts this month from Your power comes from your purpose by Keith Abraham, 6 ways to start living a revolutionary life by Alicia Curtis, Hire Right - The First Time by Ross Clennett, and Who is Responsible for Employee Engagement Anyway? by Ian Hutchinson. Finding purpose, living a revolutionary life, having the right people for us join us on the journey by achieving real engagement are problems for most people. Creative tension can turn problems into opportunity. Creative Tension involves three simple concepts that, when put together, create a structure that provides the energy for effective action. Many of you will have seen me refer to the 'elastic band' metaphor (see TEDx Talks - Creating a Plan For Personal Success) that enables us to create the life we desire. You see, Creative Tension is about creating what we want. Problem Solving, on the other hand, largely focuses on what we don't want. Artists tend to use Creative Tension while people in business tend to use Problem Solving. My argument is that business people should follow the practices of artists and also focus more on using Creative Tension rather than Problem Solving. Imagine that Pink has decided to write a new album. What approach do you think would provide Pink with the biggest probability of creating an album full of smash hits. a) To take the approach that at the start of the writing process that she has a problem to resolve. The problem is, "I don't have any new songs ready to put on my album." To resolve this problem Pink may recruit a bunch of her musician friends and brain-storm a heap of ideas that they believe would be likely to eventually generate the 'right' songs for her album. As each song is recorded Pink's problem would reduce because she would now have some songs for her album. Finally Pink would finish her album and release it to the public. b) To take that approach that an album is a work of art and that the art requires some form of inspiration. Focusing on the quality of the album that she wishes to create, Pink would generate a number of experiences to enable her to fully picture what the album will be like. Once the 'direction' of her album is clear, Pink would then recruit artists to help her to bring her 'picture of success' into reality. The number of songs on the album and the length of the songs would all fit into Pink's vision of what the album was going to look like. Eventually, Pink would 'create' the album that she desires. Music, art and films are all treated as creations to be made rather than problems to be solved. Alfred Hitchcock is famously reported to have refused to let his writers 'close out' a story line too early. Instead, Hitchcock would prefer to 'hold the tension' of an unfinished storyline so that true creativity amongst he and his writers could be inspired. The result; Hitchcock became one of the greatest film directors of all time and is still known today for creating stunning plots, scenes and movies. Really, this list could go on and on, but I think you 'get' the picture. Business people use the same approach to these problems as described in 'a' above for the artists. They gather a group of colleagues, brainstorm a bunch of ideas to resolve the problem, select the 'best' answer and then implement that answer in the hope that the problem is resolved. Usually the 'best answer' does have an impact on the problem and it does reduce in its intensity. As this occurs and the original problem is less of a problem, less effort is put into resolving the problem. Why? Because now other, more serious problems require focus. And so the process goes, on and on and on. A bit like a dog chasing its tail! What if, on the other hand, business people learnt to focus on what they are really trying to create? Rather than focusing on problems that need to be resolved, what if business people focused on the customer experience, the employee experience, the community experience of their service or product? 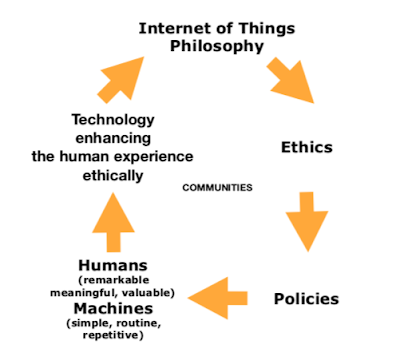 And what if this focus was present at all levels of the organisation? Art is generally not released to the public until it is created. In many ways art is created in a vacuum. Once created it is then released. Business is different. Much of what goes on in a business can't be placed into a vacuum until it is created. The way the world works simply won't allow it. In business we 'change the wheels on the bus while the bus is driving down the road'. It is for this reason that problem solving, in a business context is still relevant. There are some problems that simply have to be resolved. Such as an unhappy customer 'right now'. However, what if problem solving in a business was provided within the context of Creative Tension? In other words, what if the experience that we are trying to create for our customers, or the experience and culture that we are trying to create for our employees was the guiding force for our strategy, actions and problem solving? Creativity is challenging because of the tension that is generated when we become clear of what we want, but have no idea of how to bring what we want into reality. Artists experience this tension all the time and have learned to embrace it. Business people on the other hand are scared out of their minds when they don't know 'how' to bring the future they desire into reality. This is why most business people focus on Problem Solving rather than Creative Tension. Problem Solving is simply more comfortable. "We know 'how' to problem solve. We don't know 'how' to create." If you are not sure of what I mean you might like to view the video The Gates. As you watch the short video, consider the power of Creative Tension that went in to bringing the vision of art on such a large scale into reality. 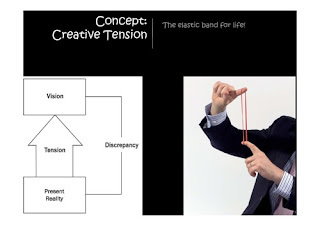 How present is Creative Tension in your organisation? What are your examples? Gary recognises Robert Fritz whose writing over the past two decades has inspired his thinking and practice on this topic.